Posted on December 15, 2014 by Financial Underdog	in Uncategorized. We live in a day and age when majority of people live paycheck to paycheck and are under constant pressure of money issues. According to recent poll by The Canadian Payroll Association, more than half of polled Canadian employees would find it difficult to meet their financial obligations if their paycheques were delayed by a single week. For younger people it’s even higher – 63 per cent of people between ages 18 to 30 report living paycheque to paycheque. I’ve had my share of financial issues in my life as well. I’ve lived paycheck to paycheck for quite some time. At some point, I had negative amount of money in my name. There’s nothing I liked about this way of living, and I knew I had to move towards something better. What’s better? Personally, I think you can reach a point when money doesn’t worry you on everyday basis. It doesn’t mean you have all the money in the world and don’t have to work! It simply means that your financial side of life is under control and you are always prepared. I call it “financial awesomeness”. Being financially awesome also means you’re no longer under great stress of living paycheck to paycheck. You can afford to spend more time with your family. May be working four days a week instead of five simply because you no longer need every single dollar from your paycheck? Enjoying extra trip overseas here and there? All these things sound appealing to both me and my wife, and we’re doing everything we can to move towards it. Simplifying finances means doing a complete overhaul of your finances by nuking them and rebuilding from scratch with the sole purpose of making them as simple as possible and as transparent as possible. Average couple today has two checking accounts, seven credit cards, three saving accounts, and three loans. How can anyone effectively keep track of all those? It’s impossible! Just few years ago, we were in the exactly same position. We had three checking accounts (my personal, my wife’s personal, and our family account). We also had a number of credit cards we opened at different times chasing rewards and points. On top of it, I had a number of loans ranging from school loans to car loans. It seemed to us that our money was going seven different directions at once. Then we went on cutting spree, and cut up all the unnecessary accounts. Instead of three checking accounts we now only have one. Instead of 5 credit cards we now only have one. One savings account (though multiple sub-accounts for different saving goals) instead of three. And all of a sudden, our financial life became very simple to manage and keep track. Nobody likes budgeting. For most people budgets never work because it takes a very high level of discipline to stick to one, almost to the level of obsession. If you’re married, it’s even harder as you have to set the budget together, agree to it, and make sure both of you avoid overspending in any of the categories. It gets even harder if you didn’t follow step # 1 and your financial system is still a mess with multiple checking and credit accounts. Instead, I would recommend tracking your spending and making sure you simply spend less than you make. Forget about setting budgets for lunches and gas for the month, just make sure you are not spending more than you make. Your paychecks should always be greater than your expenses! If you make $5,000/month between your spouse and yourself, your monthly expenses can’t be $5,600 because eventually you’ll burn through available cash and be left with nothing. If you make $4,000/month, and only spend $3,500 it means every month $500 stays in one of your accounts, and you’re cashflow positive, awesome! Yes, we had to cut a lot of things to prevent ourselves from going into negative cashflow. If you’re spending more than you make, going to a restaurant might become a thing of the past too. But at the end of the day, if you’re serious about achieving financial independence and becoming awesome with money, it’s a small sacrifice to make. Once we’ve simplified our financial life and achieved positive cashflow, it was time to put that extra cashflow to work. This is when we’ve started paying off our debts. Here’s a sad fact – your debt makes your bank richer and yourself poorer. All debt costs you money that you voluntarily hand over to your bank in a form of interest just for the privilege of being in debt. If you buy a car, you pay interest. If you have a balance on your credit card, you pay interest. If you have a line of credit, you also pay interest. Newsflash – achieving financial awesomeness is tough if you keep paying interest. Once I’ve paid off the school loans, I’ve moved on to paying off the credit card. Once credit card was paid off, I’ve sold and paid off my truck. Yes, it was harder than it sounds, don’t get me wrong. But the awesome thing about paying off debt is that it gets easier every month as your already positive cashflow goes up because you’re paying less interest and get to keep more of your money. It’s like a snowball that gets larger and larger as it rolls down the hill. 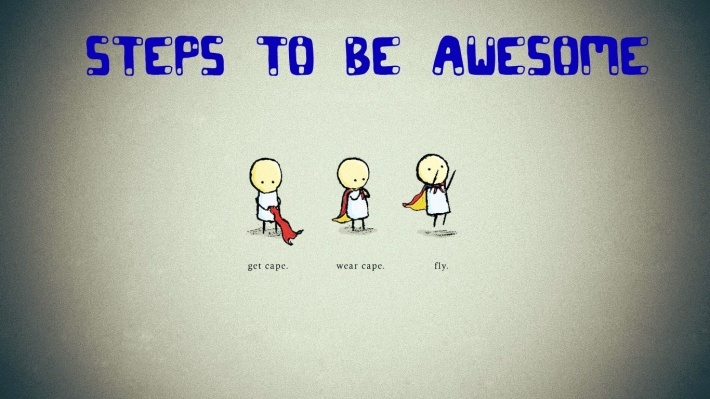 If you’ve followed the steps from 1 to 3, you’re in the awesome place already. You spend less than you make, you have surplus cashflow, and hopefully you are completely done with borrowing money. Now what? Now I would prepare for the unexpected. Financial emergencies happen, and you want to be prepared for them to avoid going backwards. After all the effort you’ve put into paying off your debts and achieving financial awesomeness, you never want to go back, right? – Grow your checking account balance to a healthy level. Perhaps set a goal for your bank account, and make sure to never dip below it. – Set up an emergency fund. Most people recommend at least three months worth of expenses saved in a separate savings account just in case something happens. – Life and disability insurance. While it might not make sense for everybody, you should take a look at your own needs for insurance. Might make perfect sense to get insured. Once you’re cashflow-positive, have no debt, and are prepared for emergencies, investing is the natural next step on your way to financial awesomeness. The beautiful thing about investing is that you hand over your money to people who know about investing way more than you do, and you put your money to work harder than you’ll work. I’d recommend setting up a goal for yourself for the amount of money you’ll be contributing monthly towards investing. I’ve started investing with just 5% of my income simply because I could not afford to dedicate more money for it. But as the time went, this percentage eventually went up as our income grew and our expenses dropped. Currently, we’re committed to investing 33% of our income but would like this percentage to go even higher. We have yet to reach this step. Currently, we’re paying extra on our mortgage and trying to get the balance as low as possible. Unfortunately, we’re at least 15 years away until it’s completely gone. This makes me a Sad Panda. The amount of interest we’re annually hand over to the bank makes me gag a little, but this is the price we had to pay for home ownership, so not much we can do about it but to keep paying it. Besides, we love our home. Life will be wonderful once the mortgage is paid off. This will free up a great deal of cashflow for you that you can direct to better use. Without mortgage payments and only taxes and utilities to worry about, potentially it will allow you to live off much lower income if you choose to do so. If you have a mortgage, consider increasing your payments to save a great deal on interest in the long run. Even switching to bi-weekly payments will save you tons of money. Heck, I bet if you increase your mortgage payment by just 5%, you’ll actually own your house much sooner and will reach financial awesomeness much quicker. Get on your way to financial awesomeness! All very great tips, living below your means is a big one to get ahead in your personal finance. Without it you can’t achieve the other important steps. Thanks Tawcan 🙂 Simple works, too bad lots of people ignore simple and look for complicated solutions.